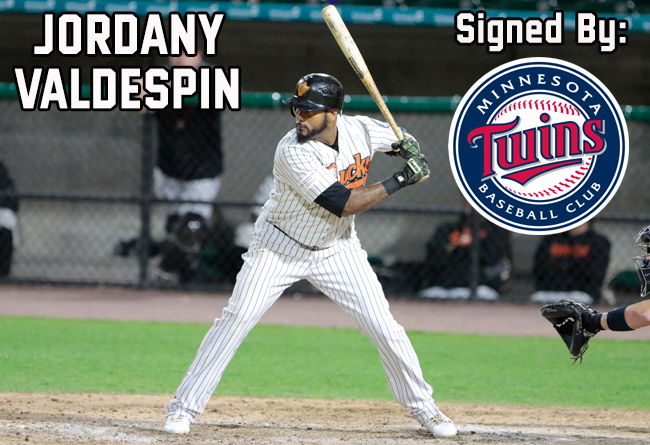 (Central Islip, N.Y., Feb. 6, 2019) – Long Island Ducks infielder Jordany Valdespin, the 2018 Atlantic League Player of the Year and Baseball America’s Independent Leagues Player of the Year, has been signed by the Minnesota Twins. Valdespin earned a host of accolades during the 2018 season, his first with the Ducks. He became the first player in franchise history, and fifth in Atlantic League history, to be named Baseball America’s Independent Leagues Player of the Year. He also became the third Ducks player ever to be selected as the Atlantic League’s Player of the Year (Ray Navarrete, 2009; Lew Ford, 2014). The 31-year-old was tabbed to play in the league’s All-Star Game, held at Long Island’s Bethpage Ballpark on July 11th, and was chosen as the second baseman on the league’s Post-Season All-Star Team. In addition, he was named the Atlantic League’s Co-Player of the Month for April/May and was voted by fans at the end of the season as the Delmonte-Smelson Team MVP. The Dominican Republic native led the Atlantic League with 154 hits, 94 runs scored and seven triples during the 2018 season, while ranking second in batting average at .3377, just .0007 from the batting title. He was also among the league’s top five in several other categories, finishing second in on-base percentage (.399) and total bases (222), third in stolen base percentage (.857) and fifth in slugging percentage (.487). Following the end of the 2018 Atlantic League season, Valdespin went on to play with Toros del Este in the Dominican Winter League, leading them to a Championship Series appearance. He was selected as the league’s Most Valuable Player after leading the circuit in batting average (.349), on-base percentage (.429), OPS (.850), hits (58), total bases (70), and stolen bases (14). Valdespin becomes the sixth member of the 2018 Ducks to sign a contract with a Major League organization and fourth this offseason. Wilkin Castillo (Yankees), Daniel Schlereth (Mariners) and Emilio Bonifacio (Brewers) all had their contracts purchased during the 2018 season. Schlereth (Red Sox), Taylor Grover (Reds) and Travis Snider (Diamondbacks) have all been signed this winter. Valdespin previously spent four seasons at the Major League level, including two with the New York Mets (2012-13) and two with the Miami Marlins (2014-15).